Written by: Sheri Spencer, C.E.M.T., P.T.S. 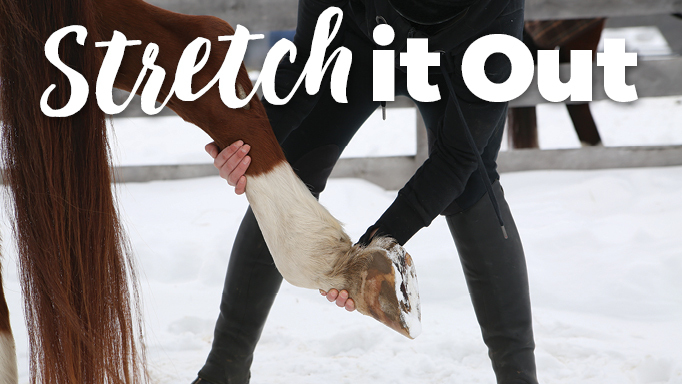 Stretches to improve your horse’s health and performance. Gentle stretches feel good, are easy to do, and anyone can (and should!) do them with their horse after training. As part of a regular routine, stretches will become familiar and can achieve improved recovery, increased range of motion, and important bonding with your horse. Through repetitive contraction during training, the muscle length becomes incrementally shorter and can contribute to aching, tense muscles. By elongating the muscle fibres through stretching, it helps restore them to their full length, releases tension, and can improve the overall range of motion. Stretching refreshes blood flow, improving the circulation of nutrients and removal of waste byproducts to catalyze recovery. Since it can be harmful to stretch a cold muscle, stretching immediately after training is most advantageous. 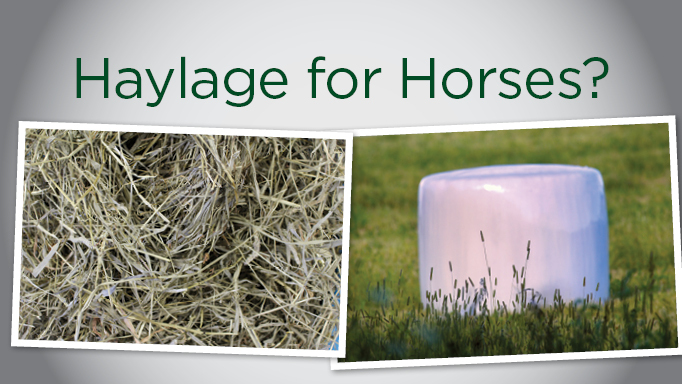 The muscles are already warmed up and your horse is most likely to genuinely feel good while reaping the benefits. Always be mindful of your own safety, watching your toes and avoiding leaning over the extended leg to keep your head at a safe distance. Before beginning, ensure the horse is standing squarely, especially if this is his or her first time, and move slowly and gradually through the movements, never bouncing. Each stretch can be held for 10-15 seconds, but the horse will often withdraw if they’ve had enough. 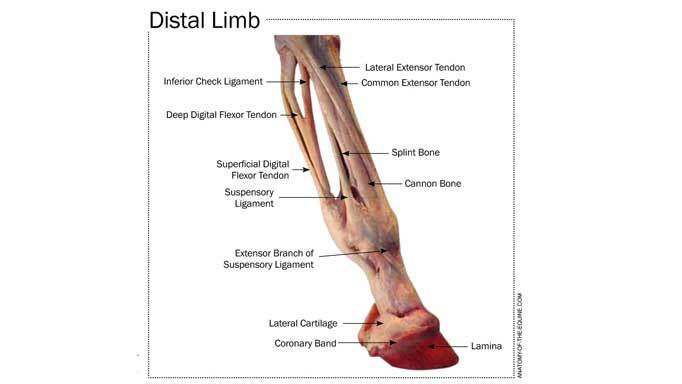 A common reaction after beginning to move a limb forwards or backwards is for the horse to hike their legs inward. Continue to support the weight and your consistency will lend to your trustworthiness. As the horse begins to release, unfurl the leg gradually, encouraging relaxation. When you reach a point in the stretch where there’s no more give, or the horse consistently pulls back or shifts its bodyweight with the stretch, it could be indicative of their limit or that the position is uncomfortable. Confirm that their limbs are aligned with their body and when reaching under their body, keep the limbs as low as possible. Don’t be discouraged if the stretch seems minimal; the effort and process make it beneficial and are more important than any end position. Standing beside a foreleg, facing the tail, place your outside hand at the back of the knee with your inside hand at the fetlock, cueing as you would to pick up the hoof. Turn your body to step forward with your near leg while you raise and uncurl the leg into forward position. 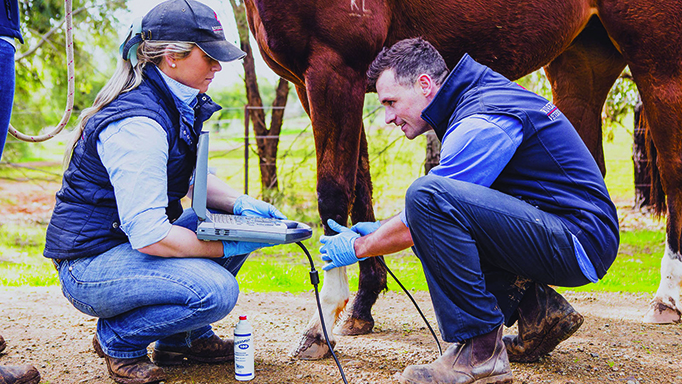 Keep one hand cupped at the back of the knee and the other cupping behind the pastern. Ensure your grip is supporting their weight without squeezing. You can rest your elbows on your knees for extra stability and to spare your back. Widen your stance and lean away, easing the leg forward with your weight. If the horse resists or pulls back, follow the movement to support the limb and they’ll learn to trust your hands as support. Always ensure the leg is in a straight line forward from their body and not being pulled to either side. If the horse is comfortable and stretches into your hands, you can adjust your position by releasing slightly and stepping in front for a second stretch, keeping one hand to support the knee with the other cupping the heel and, ensuring alignment, let your weight gently pull the whole leg forward from the fetlock, stretching up into their shoulder. When the stretch is released, continue to support the leg as you bend it back into the raised, neutral position, and squat facing them to move into the next stretch. In their neutral raised position, cup your hands at the front of the pastern/hoof and slowly lower your hands, encouraging the horse to lower the hoof. Move your forward-most hand up the cannon bone to support below the knee and, keeping the hoof low to make it more comfortable, guide the leg backward towards the hind foot on the same side. As the horse releases for you, shift your weight gradually towards the haunches to deepen it, moving slowly and feeling for the threshold. When the stretch is satisfied, carry the leg back into a neutral position and lower it to the ground. By guiding as the leg is lowered, it helps reinforce your reliability; dropping the leg can be jarring and disruptive to the mood. Repeat these stretches on the other side. Stand as you would to pick out a hind hoof and ask the horse to raise his leg from the back of the fetlock. Step back towards the front leg, cupping your hands around the fetlock, and lean your weight into your hips to bring the hind foot towards the fetlock of the foreleg on the same side. The horse may pull back sightly, resisting, so just follow the movement, supporting the leg. Give the horse a moment to relax and try again. They will indicate their limits, so move slowly and listen. After the forward stretch, carry the leg to a neutral position, still supporting the weight as you adjust your position for the next stretch. With the hind leg raised, turn to face the haunches and adjust your hands so that, if you’re on the left side, your right hand supports the front of the pastern and your left hand cups the front of the cannon. Step with your right leg past the tail, carrying the leg with you. Use your weight, widening your stance, to achieve the stretch, and keep an eye that the extension is in line with the body. As you release the stretch, walk the leg back to a neutral position and guide it to the ground. After attempting a stretch once, observe the difference if you release slightly, then stretch again. In this way, if you trigger the Golgi Tendon Organ (GTO) in the first stretch, the inhibitory response will be activated for the second. These proprioceptive receptors, located in the tendons where muscles attach, trigger a reflex reaction that prevents further muscular contraction when activated by tension (stretch) to safeguard from muscle tears and avulsion of tendon from the bone. When activated by stretching, a deeper stretch becomes possible. Young or inexperienced horses may in all likelihood not understand what you’re up to and demonstrate natural resistance born of confusion. Their resistance may prevent activation of the GTO response, but patience and encouraging relaxation should take precedence and future sessions will be more likely to yield improvements. 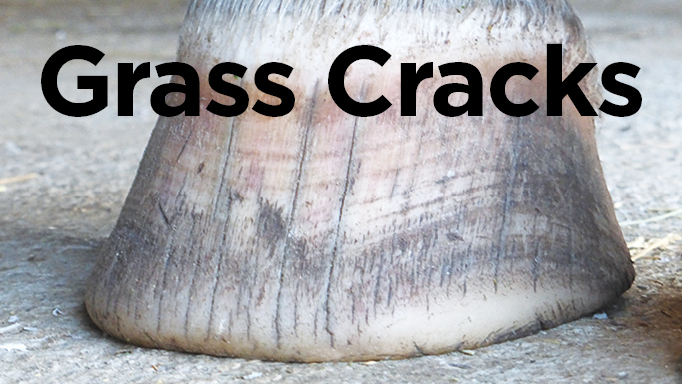 Dealing with springtime hoof cracks.